Monarch RCA Remote Contact Assembly with 6ft cable, contact tips(convex and concave), 10cm linear contact wheel Reliability Direct, Inc. Your Direct Source for Reliability, Maintenance, Test & Measurement! 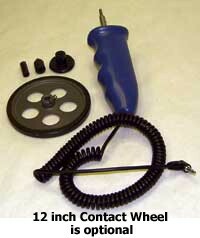 Unique handle grip allows user to safely make contact measurements while reading the display in a safe position. Works with all Monarch Pocket Tachometers capable of linear rates.